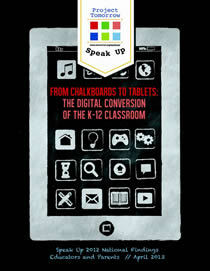 From Chalkboards to Tablets: The Digital Conversion of the K-12 Classroom is the first in a two part series to document the key national findings from Speak Up 2012. For the past few years, Project Tomorrow has used the Speak Up survey to diligently document the growth in educators’ access to emerging technology devices, tools and services, and how that increased familiarity has resulted in greater interest in digital learning. The Speak Up survey data has also highlighted the growing expectations of parents each year for interactive and collaborative digital learning environments that they believe are essential for preparing their child to compete in the global information society. And, we have shared information and research over several years about the widespread national interest in enhanced college and career readiness for all K-12 students. Given all of those positive conditions, why is there so much new fervor around digital conversions today? 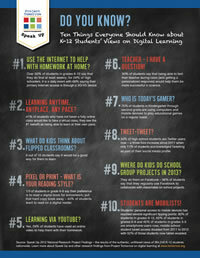 What makes today’s education landscape different than last year, the year before or five years ago? What is different? “From Chalkboards to Tablets: The Digital Conversion of the K-12 Classroom” takes an in-depth look at the transformative factors that are driving this new digital conversion momentum and the new capacities to build toward to support the process. Today’s teachers, administrators and parents are increasingly mobile-using, texting, tweeting social media devotees whose personal and professional lives are dependent upon Internet connectivity and online collaborative learning environments. A majority of teachers (52 percent), parents (57 percent) and district administrators (52 percent) are now regularly updating a social networking site, and many are using a personal mobile device such as a smartphone to do that. Four out of ten district leaders (41 percent) in 2012 pinpointed achievement measured by test scores and closing the achievement gap as top concern points for their district, a growth of 21 percent over 2011 responses. Teachers are increasingly interested in leveraging technology for activities with students and many are modifying their instructional plans to incorporate more digital experiences. Nearly a majority of classroom teachers (45 percent) noted in 2012 that they were creating more interactive lessons because of having access to technology, an increase of 25 percent in just the past two years. A continuation of the multi-year stagnation in funding for new education technology investments is finally forcing school and district leaders to scrap the plans they have on hold, and to test new ways to leverage technology to increase revenue or decrease costs even though some of these approaches challenge conventional wisdom and long held policy positions. In 2012, we see proof of this digital conversion happening right in the principal’s office. Today, over a third of principals (36 percent) say that a new Bring Your Own Device (BYOD) to school policy for students is likely this school year. Social media and digital tools and resources have transcended the classroom and are emerging strongly as key components of 21st century school to home communications. 37 percent of parents wish that their child’s teacher or school would communicate with them via text messaging, less than one-quarter of teachers (23 percent) say that texting between parents and teachers is a common practice today.